In the April 7, 08 Businessweek: Busting a Rogue Blogger. About a person blogging anonymously on the 'Troll Tracker' blog, which followed patent trolls, and who turned out to be a Cisco patent attorney. As someone who has blogged both in and outside of a large company for years, this provided some useful insight into the dilemmas of separating the origins of opinions effectively. I had never read the 'troll trackers' blog, but the article says it was opinionated but largely innocuous. Then there is always the problem of comments. Commenters' opinions can be much more volatile than the bloggers own. Bloggers love comments, because it is proof of engagement with their audience. So there is a tendency to allow more license to commenters than might have given yourself, to indicate your openness to other opinions. It was unclear how closely the comments were moderated. In this case comments included charges of acts that were felonies and even an implied death threat. This case has ended up in defamation lawsuits against the blogger and Cisco. Including Cisco in the lawsuit shows how relatively little the 'my opinions are my own' disclaimer in blogs like this one mean. Also though Cisco was not involved in their employee's blogging, they do have an official public blog, where they recently included a post that updated their employee blogging policy, worth a read. Article about some of the latest developments in Intellipedia. Our early looks at this intelligence community resource, founded in 2006, indicated it was an architecture based on a number of interlinked wikis. Is Google's involvement an indication that this will primarily be driven by search? There have been some interesting criticisms of how such systems can effectively work in government (or in large corporations!) Notable quote: 'We have a command chain, not an information chain'. What are the important qualities of an 'information chain'? How do you make that deep architectural change happen? People engagement is key. Google is involved so much of the computing work I do there is a natural worry about how private our interactions with Google are. To what extent have I opted in to complex use of my data? A recent conversation with a colleague who asked how I could let Google manage so many of my important computing tasks brought home the issue of privacy. Do we really understand how each element of data can be used, both alone and in concert with other data, both what I provide and what other sources Google may use? Today I discovered in the Google Blog that Google is attempting to be more transparent about the privacy issue. Have not explored what they are saying, but will do so. Garr writes about typography. This brings to mind all sorts of experiments we did during the early days of personal computer typography. We linked early and limited character sets to early desktops, and because there were no printers that could be used to generate results, used plotters to construct originals and copied the plots. We were still engineers, so there was not much art in the output, but it looked like art to us. The broad point the article makes is one I have heard in other domains, once you give amateurs the ability to execute, the overall level of the art drops. Maybe, but I think it's worth it. The article includes some useful links and resources if you would like to raise the bar. Robert Weissman speculates furiously about why this happened. In Presentation Zen, discussion and pointers to some of Nicholas Negroponte's TED presentations.
" ... In this issue we are very pleased to bring you the findings from the SNCR Research study, "New Media, New Influencers and Implications for the Public Relations Profession." In addition we feature a NewCommentary by SNCR Senior Fellow Francois Gossieaux on "community vs. content" and the latest TopTips on blogger relations from the SNCR's Best Practices committee. We also share the results of new research from SNCR Vendor Council member TNS Media Intelligence/Cymfony, and invite you to take our latest survey, the "2008 Online Community Survey," sponsored by Deloitte and conducted by Beeline Labs. And, as always we share the latest news, announcements, updates and upcoming industry events ... "
Have now followed up on several versions of this. Promising idea, but also reminiscent of the direction of expert systems and the use of visual systems to program. I much like the idea of using systems like these to explain how they work and check for errors, but I am doubtful you could have managers without considerable technical saavy building their own systems. Worth looking at. Software being developed at Intel makes it easy for people with no programming experience to combine data from different Web pages ... "
Saw Walt Mossberg's video on the new Dash Express navigation system. The system uses uploaded information from other Dash users to provide reports on road and traffic conditions. Other systems, like Garmin's, use traffic data you can subscribe to for an extra fee. A nice example of crowdsourcing. As suggested, this only works if there is a critical mass of other users on the roads you are heading to. Such a network might also have side benefits for truck fleet operators using the same data, decreasing transportation costs. I would guess this is a direction most navigation systems would head towards. This post is about the problem of how to distribute human judgement problems to the crowd using Amazon's Mechanical Turk program. I have been examining these kinds of problems, and this an interesting take. See Dolores Lab's blog where they are tracking some illustrative examples.
" ... BEA Systems, Inc. BEAS, a world leader in enterprise infrastructure software, today announced that Procter & Gamble PG implemented a service-oriented architecture (SOA) powered by BEA technologies. 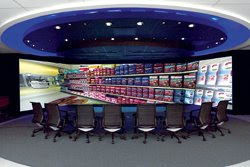 The SOA powers a new on-line workspace at Procter & Gamble. It has been designed to improve decision making, increase access to knowledge assets, and support decision making ... "
On April 23, at Stanford, we will be giving our first major public presentation of the outcomes of our research on the "digital youth" project. We are near the end of three years of ethnographic work on 22 different case studies of youth engagement with new media. The MacArthur Foundation and Common Sense Media are organizing an evening event that will include talks and poster presentations from our team members, and a panel or respondents including Tim O'Reilly of O'Reilly Media, Deborah Stipek, dean of the Stanford School of Education, Linda Burch of Common Sense Media, and Kenny Miller from MTV Networks. Please forward this announcement to folks who you think might be interested. You can see program details and register to attend this event (By April 18) at: www.eventsatcommonsensemedia.org and the project web site ... "
Google has patented a technique " ... to decipher which page regions and topics the viewer is interested in based on the viewer's behavior after he's arrived at the page ... ". Normally the choice and placement of ads are done before the user arrives at a page. This looks quite broad on a quick scan, but the implications could be interesting. It comes to mind that with all their data, it would easy to set up a simulation to test all sorts of alternative model constructs. Such predictive models could then be used to optimize and sell given ad arrangements. A potentially powerful idea. Also in Slashdot. Just a year ago I was expecting free ubiquitous WiFi to be available for all my travels. Now I am not so sure. It's long range cousin, WiMax, has also seen some setbacks. My IPhone is always on the lookout for wireless connections, and since many advanced phones have wifi, the demand is growing. Will it be government provided or entrepreneurial or poached from hotspots? Update: And wireless has more security vulnerabilities. Good overview article on aspects of understanding shopper behavior, including a description of Kimberly Clark's much publicized virtualization project. Also a number of other approaches and vendors in related spaces.
" ... How many customers walked down an aisle? What products did they look aT? What did they buy? How much time did they spend? Questions like these are becoming increasingly easier for retailers to answer in today's technologically driven world. With the help of innovative, cutting-edge technology systems, companies can delve deeper into the world of in-store metrics and yield more accurate, detailed results. More retailers are taking part in this in-store observation, watching customers while they shop in hopes of determining what works—and what doesn't. Infrared sensors, behavior-capturing video cameras, facial coding analysis and virtual reality simulations are just some of the many technologies retailers are experimenting with today ... ". Evan Schuman looks at Starbucks’ Revamped CRM Program Clever, But New Web Effort Misses The Mark. He emphasizes the overpriced offerings at Starbucks, and I agree they are, but having been involved with Folgers in the past, merchandising quality, accessibility and convenience do work. Their customers understand this, and a loyalty offering helps justify visits for some consumers. His StoreFrontBacktalk covers retail technology spaces I sometimes miss, good to add to your feed. Anthony Townsend brings up the Future of Presence. Large companies are quickly putting in Telepresence centers to both minimize the cost of travel and the ease of reaching out. The expense for such realism remains high and it's implementation unevenly distributed. Fully reaching out still means being there but the arguments are changing. Anthony points to some useful discussions about the subject. A video celebration of Pi. OK call me a geek. Amapedia is a community of users who share information about the best products they own and love. By submitting information about your favorite products you will be joining a community where people freely share their knowledge and give their opinions and advice. You are able to read about the latest and best products in the market today from the viewpoint of real people who purchased the products you are interested in. What should I put into an Amapedia article? Think of an Amapedia article as a product encyclopedia entry that everyone who comes to an Amazon product page can see. Amapedia introduces a new model for jointly constructing a product encyclopedia called "collaborative structured tagging": in addition to writing free-form Wiki text you can also tag a product with what it "is" (e.g. a "Vacuum Cleaner") and what its facts are (e.g. "bagless" and "Manufacturer: Hoover"). Amapedia then uses these structured tags to let you discover, search, and compare related products in novel ways ... "
An area of interest for me has been the history and evolution of retail spaces and how these can be utilized by consumer package goods companies. Clarence Saunders of the Piggly Wiggly chain claims to have created the first self-service grocery chain in 1916. Since the 1940s there have been many versions of drive through convenience and pharmas, common today. A company that is trying to take this drive-through experience to a yet more convenient and consolidated level is Autocart, which I have posted about previously. Have also had a conversation with the founders. One particular aspect of this idea was to have a warehouse with many SKUs connected to the drive through, essentially providing a supercenter selection with drive through convenience. Press releases have indicated that their first center would be built in Albuquerque NM in 2006, and a release last year that mentioned Oklahoma City, but I have seen no indication that this came about. If you take a look at their current web site it appears that they are creating a number of variations of the basic idea. A recent paper included in their site says that a Midwestern US retailer will be testing their AutoTram concept in early 2008. Concept is intriguing. Still waiting for the experience of an actual implementation. Pay-By-Touch has filed for Bankruptcy, closing all their operations. Their system was one of the best known commercial applications of biometric payment verification. In their case using fingerprints as the biometric. Biggs, Jewel-Osco and Albertsons are well-known retailers that have used their systems since 2006. I participated in one of their tests and was impressed by it's overall reliability. The fact that fingerprints are often associated with law enforcement and privacy issues related to fingerprint data were often brought up. When questioned, very few shoppers had concerns about these issues. I also know of no data losses encurred by PBT. An unfortunate step backward for improved payment verification via biometrics. The Allen Institute for Brain Science in Seattle, Washington, US, is today launching a four-year, $55-million effort to build a three-dimensional map documenting the levels of activity of some 20,000 different genes across the human brain.... "
I see that Forrester Groundswell has launched an updated blog, featuring their social technographics ladder and including an intriguing " ... free data tool about consumers around the world and their behavior around social technologies ... ". Have not explored the book or the tool yet, but plan to. When I worked with home innovation applications, I recall that the idea of mixing sensors and focused energy was discussed as feasible during a visit to Microsoft's future home. Now Electrolux has come out with an oven that will set it self. Not for sale as yet. Good piece from Knowledge@Wharton: The Experts vs. the Amateurs: A Tug of War over the Future of Media. Responding to a recent Newsweek article. This is a topic I have mused over for some time. What has happened is that the web has empowered the amateur in new ways. The implications are still being figured out. It's the anniversary of the birth of Bob Goulding, partner of the comedy team Bob & Ray. A tribute and link to their funniest sketch, an interview with the president of the Slow Talkers of America. I was at Barnes & Noble last week looking through their stock of journals. I was attracted to a leather bound volume with graph-paper pages. The graph paper appealed to my engineering dimension. Perhaps I could use the pages to sketch graphs of interesting relationships? It also made me reflect on the number of times I have kept and have been involved with journals of all types. I kept a written journal from an early age, using it to record plans and thoughts through my university years. Rereading these years later has often been revealing. In college I was a very careful and neat note-taker. Decades of typing have changed that. An early task in a corporate setting, before desktops were common, was to investigate how formal laboratory notebooks could be recorded and 'signed' using a computer. The simple act of signing such a journal turned out to be an impediment that took some time to solve. A light pen was an early solution. Later, as part of a team looking at artificial intelligence applications, we used bound paper journals to record our notes, seeking to formalize intellectual property results. When the first E-mail systems emerged in the corporation in the late 70s, I started to use electronic messages, or informal notes to myself (that were also accessible to others) to record thoughts and findings so I could refer to them later. Ironically, almost all of these journals, except a few I printed out, are now gone. Lost to changing computing systems. Hand written journals would likely have survived. Always had a fascination with the journals of others. From Pepys' diary to the insight gleaned from laboratory notebooks that attempt to trace the specifics of experimentation. As archives, as proof and trails of current and past thinking. An internal need to be a primitive journalist. I started a corporate blog in 2002. In part for myself, and in part to inform others about my research. Technology had improved to make it easy to share and search this journal. Remembering my lost journals of previous years I carefully backed up the journal, which grew to 4100 posts by the time I completed it. It's on a CD-Rom, which should survive, shouldn't it? I still have punch cards from that era, but nothing to read them on. This blog is the surviving echo of that company effort. After looking at the leather bound journal at Barnes & Noble for some time I put it back on the shelf. Can I ever go back to keeping a paper journal? Are there advantages to doing that?
" ... The Kimberly-Clark Corporation, the maker of Kleenex tissues, is joining forces with Meetup for an initiative sponsored by the company’s baby brands, like Huggies and Pull-Ups. The effort, aimed at mothers of young children, represents Meetup’s first foray into sponsorship. The site is known as a facilitator of offline meetings of computer users who share interests like politics or parenthood ... "
I have had some interesting conversations about Wikipedia of late. Pete Blackshaw posts some interesting insights about the ubiquitous and often warily viewed online knowledge resource: Ten Things Every Marketer Should Know about Wikipedia. Arthur C. Clarke, technology visionary, who inspired me and many others, is dead at 90. Informs has a new magazine, called Analytics. You can get an overview here. Worth looking at. It should be noted that the term analytics here is used to describe a broad set of mathematical modeling methods, usually called operations research, not the narrower use of the term to describe site traffic analysis. 12:00 p.m. ET, More information and register.
" ... join Consumer Goods Technology and Oracle for an educational Web seminar this Thursday featuring a panel of industry veterans including Coca-Cola Co. and Cheryl Perkins, Founder and President, Innovation Edge (and former Kimberly-Clark CIO) , during this live Web seminar which will provide you with the blueprint for success regarding innovation in consumer goods. Consumer goods companies need to improve their innovation results in order to achieve sustainable growth in an environment dominated by retail consolidation, consumer empowerment, regulatory constraints and complex supply chains. The objective is to compress innovation cycle times, reduce costs, lower risks and increase sales and margins of new products – at the same time ... "
Nicholas Carr talks about the implications of cloud computing for the future of online marketing in an article he wrote for AdAge Digital. Worth thinking about, but regardless of how Internet capabilities and computing services are provided, the wants of the consumer will be the same. In Advertising Age: " ... Unilever has been named Digital Marketer of the Year by Advertising Age, which cited its "Evolution" viral video on behalf of Dove, and a short-form video campaign on behalf of anti-antiperspirant Degree that tied into the TV drama "24." The campaigns all combined online and traditional elements. As Unilever's North American media director Rob Master said, "Digital is far from done in isolation ... " . The Dove Evolution video is the effective, and some say hypocritical piece of viral video that criticizes cosmetics. Hypocritical based on other Unilever digital efforts. Forrester's Josh Bernoff on Corporate Social Technology Strategy.
" ... I'm pleased to announce that we've just launched the Google Cities in 3D Program, which invites cities, towns, and other local governments to share their 3D data with the public by adding a model of their city to Google Earth. With this new program we've made it simple for local governments to share their data with us and be included in the 3D Buildings layer of Google Earth. A 3D model of a city is extremely useful to potential visitors, developers, investors, preservationists, property owners, businesses, public officials, and many other groups. By establishing a 3D representation of a city on Google Earth, local governments can more effectively engage the public and boost tourism by enabling prospective visitors to plan their visit in advance... "
After spending some time witnessing the goings on in Second Life, especially watching some of the construction going on in corporate places like IBM, I now sense a certain weariness setting in. Is it becoming sometimes clever visual chat? A recent visit found (again) not much going on. The avatars fading. The financial structures also looking shaky, the World Stock Exchange closed temporarily. New policies muddy the realities vs virtual comparison. When I published this in another forum I got complaints that said that SL is not about the corporation. It's more about personal, virtual creativity. There is much activity, just not on the corporate campus. I do like the grand experiment underway, but the idea that it is also about the world of commerce seems to be fading. Contactless cards in the form of NFC technologies are now in broad test in the US. Evan Schuman writes about a recent dustup about security issues of these technologies. There’s a lot of buzz about online communities, but how much business value are they providing – and how are organizations measuring success?
" If you're involved in managing online communities for your organization, we invite you to participate in the 2008 Online Community Effectiveness Study, sponsored by Deloitte, the Society for New Communications Research and Beeline Labs. To take the online survey, go to: http://www.communityeffectiveness.com. The survey takes only about six minutes. The purpose of the study is to assess the effectiveness of online communities and learn how organizations are measuring the success and progress of their online communities. All participants who complete the survey will receive a copy of the executive summary of the study's findings and a special discount to attend the Society's annual conference, New Communications Forum, where the findings will be shared in a special presentation ... "
Good overview article on the increasing use of brain scanning, and what it may mean, in and outside of medicine. Readability indexes, which are ways to calulate the grade-level of a piece of text, have been around for a long time. A teacher in junior high suggested we compute them for articles we had written for a class as an experiment. Since they are now easy to compute, based on measures like syllables in a word and words in a sentence, there are a number of packages that deliver them. Are they really meaningful? A WSJ article discusses the implications. This article also introduced me to the numbers guy blog in the WSJ. A new study from the the University of Arkansas about the value of backroom RFID. Have been previously involved in their studies of out-of-stock improvements. Measurement improvements of this type can reduce costs and ordering efficiency. These are the kinds of improvements are widely being sought via improvements in data transparency via non-item RFID tagging. University of Arkansas researchers found that RFID can reduce the degree of understated perpetual inventory by 13 percent, thereby helping retailers to lower their costs ... "
IP Without Laws. ... According to the paper, magic occupies an "IP negative space" where IP laws offer little protection. Because of this, the magic industry has developed a broad range of cooperative community norms to provide IP protection for those that invent tricks - and punishment for those that abuse magic IP. While the article is about IP, the paper is an excellent case study on industry cooperation. It also has an interesting description of innovation in the magic industry ... "
Back in my Industrial Engineering days I took a course in analog computing. That must have been one of the last years that the course was taught. I was impressed with the technology, but soon forgot the whole idea. It was followed with easy access to timesharing, then desktops, then laptops and maybe soon cloud computing. The idea of mechanical computing, not the same thing as analog computing, but with some useful relationships, is being re-examined and worth understanding.
" ... HP is tightening up its research and development division. Under a new plan, HP Labs will dramatically scale back the number of projects its researchers focus on in order to put more effort into larger projects more likely to yield profitable products. Among three new initiatives with HP Labs, the Open Innovation Office will work to strengthen ties with outside government, academic and commercial entities ... "
First time I have have ever seen this kind of thing. The article is confusing, but the implication is that bloggers need to be careful about their definition of humor and perceived external behavior. In multiple international venues, under varying legal contexts! As a present to myself for my retirement I bought an Iphone. I had been a user of a corporate issued Blackberry for about four years, so this was a pretty new experience. I had also recently heard a Google exec speak very glowingly about how revolutionary the IPhone was. So far my experience has been mixed. I am not an Itunes user, and only sometimes listen to podcasts, so that aspect is not big for me. The 'real' browser is good and that has been convenient, but I am not always in places that provide wi-fi, and the AT&T Edge network is abysmally slow, so that has been a disappointment. Regards interface, I was surprised that there were inconsistencies. Delete is not always done the same way, for example. I am not used to touch interfaces, so have found myself selecting and even deleting things that I did not plan to. Compared to the BBerry, the qwerty typing interface is error-prone and slow, annoying if you answer many messages with more than a line or two. The physical design of the phone itself does look a little 50s. Was it really inspired by Braun? Perhaps, based on some of the pics I have seen. I like the minimal number of buttons, but I think a more modern and striking design could have been used. And again, I think consistency of usability design could have been thought through more carefully. I see that the Iphone 2.0 interface will be addressing some of these problems, but the very simplest issues of synchronizing your contacts and calendars between laptop and mobile are problematic. I figured out ways to make these work, but it took too much effort. Though I am no longer within a large enterprise, there are security and syncing issues for that context as well. Still getting used to it. If you have plans to get one, suggest you play with a friend's before jumping in. SAN FRANCISCO (Adage.com) -- Five top package-goods manufacturers are using mobile phones in an effort to revive the art of coupon redemption. Procter & Gamble, Clorox, Del Monte, General Mills and Kimberly-Clark are teaming with retail giant Kroger for what will almost certainly be the biggest test of wireless coupons to date and perhaps even one of the most significant ventures into mobile marketing in the U.S. The aim is to reach the generation between 25 and 34 who are likely to have growing families in need of baby, home-cleaning and household products, but who don't read a lot of newspapers. "Promotions still work -- the problem is finding where we need to talk to them in a relevant way," said Irma Tavilian, baby-care and childcare consumer promotional marketing team leader at Kimberly-Clark. "The whole industry is trying to figure out these channels." Roger Entner, senior VP-communications sector at IAG Research, went so far as to predict "Mobile couponing is the future -- hands down." Besides avoiding the fuss and muss of cutting out coupons, he said, mobile coupons are never forgotten at home ... "
Back as early as the energy crunch of the 70s I have been reading about when various alternative energy technologies would be economically feasible to replace fossil fuel. These levels have always been exceeded, without much happening in alternatives. I remember $50 a barrel in particular as a holy grail level that would cause all sorts of infrastructure to change. Surprise, not much has happened. Now TCS suggests that the solar energy singularity is at hand. There are now a number of large tests of NFC (Near Field Communication) now underway. The most interesting application of this technology is the capability of using cell phones for payment. A chip is placed in a phone, the vendor has a reader to capture the needed data, some validation is performed. The cellphone as a wallet. Evan Schuman writes about the underlying training issues. I have never presented my phone for payment anywhere, so I can understand the confusion that could result. But I still remember when presenting a credit card to a vendor was viewed with skepticism. It's only a matter of time. 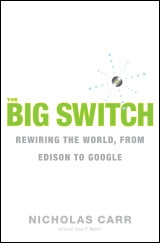 I finished Nicholas Carr's The Big Switch, Rewiring the World, From Edision to Google. Overall a good read. He starts with an interesting technology history lesson that he later uses to make a point about where he believes all these computing resources are migrating. I like historical examples and his current-day tales, but the connection is tenuous. I also have his Roughtype Blog on my feed, so I was ready for some of his arguments, somewhat restated here, that there are some dangers looming from some of the big players out there, you know who they are. His writing makes you think, but some of his points are labored. Why shouldn't I be just as worried about all the hardware be in central places as I should be about new players such as Google providing all the software? He also seems to be very worried that Google's founders are interested in AI. If they were not, others would be. Carr is a journalist, not a computer scientist, so sometimes his focus is on what is in the press or who he has talked to lately rather than what is really relevant. Overall argument is that the world is being re-wired as we speak, in somewhat unexpected ways, and there will be some side-effects we will need to prepare for. Agree. He has some interesting focus points here. The book is non-technical but it will be most interesting to those involved in high tech. See also the book's web site, some excerpts are there to get a flavor for the book. A discussion of how corporate counsel should think about virtual environments like Second Life. I agree that there are lots of issues lurking there, especially when you start doing marketing and commerce. Alex Pang over at IFTF's Future Now blog, where I used to contribute, writes about the Clover 1S Coffee maker, quoting a recent Slate article. I used to work in P&G's coffee division, mostly dealing with how coffee blends are created. Even learned to do formal coffee tasting. For a while P&G even made single dosage coffee machine, not sure if they still do. Alex muses over if an $11,000 coffee machine is decadence or pure technological progress. He thinks the latter, I agree, though I think you could get the 80 for 20 here with a little training and some off-the-shelf, much cheaper machines. The AARP Digital Community, which I had the chance to test in early beta, is now up and running. Here is a tour. A community FAQ, and community help group. AARP has a large existing membership that it hopes to turn into a social community. Good first step. An opportunity indeed. Dion Hinchcliffe on The Social Graph: Issues and Strategies in 2008. Instructive overview piece on the subject. Via Steve King: The Center for Strategic and International Studies has released a forecast map. Graphically reminiscent of transit maps. A new Wal-Mart Blog, called Check Out, is described in the NY Times. The blog is written by WM buyers and and is described as particularly candid. I did a quick scan of recent posts, and it is refreshingly open. There are nine authors covering a number of product categories. They are getting a small number of moderated comments. This is the kind of blog that works, but is rarely done by large companies outside the technology world. A good Computerworld article compares Linkedin and Facebook for six business problems. Its clear that LinkedIn looks more professional in it's typical application, but which addresses typical business networking problems better? Along the way you get an introduction to the serious capabilities of each. LinkedIn has also announced API capabilities that could make it more flexible. Also, more on the integration of third party applications. Jakob Nielsen's post: Top Ten Design Mistakes came to my attention. A good read. His fairly well known previous article summarizes: " ... To design an easy-to-use interface, pay attention to what users do, not what they say. Self-reported claims are unreliable, as are user speculations about future behavior ... ". I just got an IPhone and am now using it as my primary phone. Although it has a very interesting interface, there are a number of inconsistencies in how you do things. Have now only used it for a few days, and am still learning. Now that I am responsible for my own infrastructure I am taking more notice of the risk of using specific methods. I was quite surprised, after changing my hardware, to start being challenged by Google's blogger. Many of you have probably seen the challenge, where you have to read a distorted set of letters, to prove you are not a sim, This is called a captcha. Last night this happened several times in a row. The letters I had to read were so distorted I had to try several times. I felt somewhat put off by this. Am I a machine or human? Am I depending too much on Google's usually excellent services? In Confectionary News, Functional Chocolates, the term was new to me. Chocolate treats could be used for some sort of specific pick-me-up or even over the counter claim seems to be a very big idea and is spreading. Well I am finally done, retired, complete and finished with the big soap company. This marks my thirtieth year. Although I only worked there for 27 years. I spent a few years working a start-up, which is yet another story. I started as part of the analytics and graphics group, first primarily doing applications of optimization for the supply chain. This was in the early days of being able to readily visualize results interactively on a computer. It turned out to be a very effective way to make things clearly understandable. So we implemented things like visualized woodland harvesting plans, supply network options and simulation results. Simulate, optimize and visualize the results, that worked well. The next big chunk of work had to do with what in the late 80s was very optimistically called 'artificial intelligence'. What we mostly implemented was called 'expert systems'. We collaborated with several of the big players then, notably Teknowledge. We had a dozen or so folks in our team, and built a number of systems to do things like coffee blending, machine analysis and selection and even stain analysis. There were a number of successes, some very lucrative, but we never matched the speed or expectation of management. So after a few years success was declared and the group disbanded. Too soon I think, there were many opportunities we had in the hopper that could have prevailed. Then we looked at the idea of immersive innovation. This started with skunk works home and store centers that built contexts for understanding and engagement with consumers and other organizations. Despite all the cynical IBM ads, these can result in some powerful engagement dynamics. In the last few years I have been involved in the practical application of Web 2.0 capabilities to track the application and implementation of emergent technologies using blogs. What I did during this time was to track everything I did using an internal blog, which I left behind as an archive when I retired. This is a useful example of knowledge management, a means to easily capture a stream of knowledge, and allow you to stream it back as needed later on. The blog was read by thousands a week internally, and led to lots of consulting relationships. Now on to new challenges.